These are sooo cute and easy to do. Great for an adult or child’s Halloween Party. Cut the cheese sticks in half. Now carefully cut one end of the cheese in half leaving the top half of the stick uncut. Continue cutting strips leaving the top half uncut until it resembles a broom end. 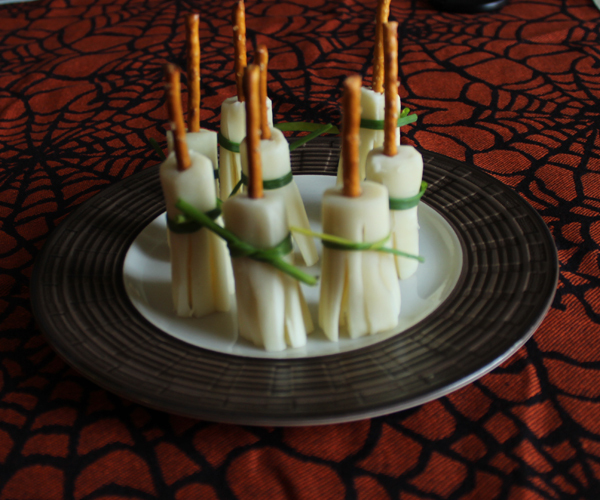 Wrap a piece of dill or chives around the cheese just above the cuts and place a pretzel in the top uncut half. It’s fall. I love sweet potatoes and they are such a healthy alternative. Combined with kale or spinach sweet potatoes create a magical meal. Prep all the veggies and set aside. Heat the water to boiling and drop in the pasta. Heat olive oil in the skillet while the water is heating and put the kale in the skillet. If you are using spinach it will go in later but if you are using kale do this first because kale takes longer to cook. Add the garlic, onion and cook until the onion is opaque. Add the sweet potatoes. Cook for a few minutes until the sweet potatoes are getting a little brown. The pasta should be done by now so go ahead and drain the pasta and place it in the skillet. Stir, add the feta and stir again. 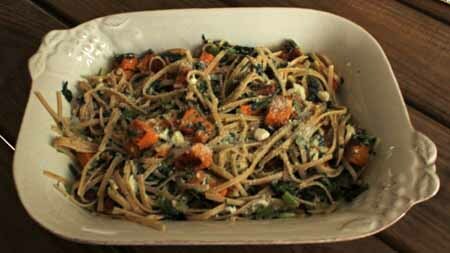 Cook over low heat for a few minutes allowing the feta to melt and combine with the kale and pasta. Top with the parm cheese and serve warm.